RefComp Semi- hermetic piston compressors are widely used not only in commercial and industrial refrigeration, but alsoin certain special air conditioning conditions. 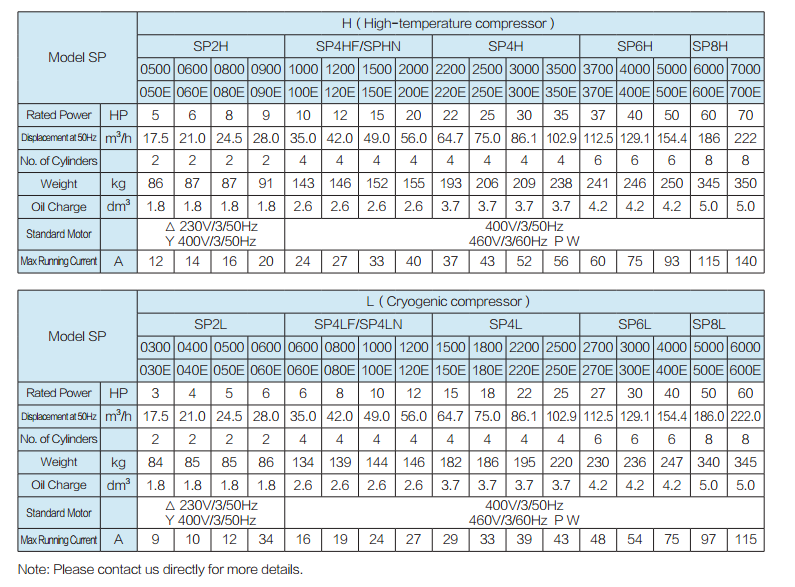 RefComp SP Series compressors have a wide applicability, good in variousrefrigeration conditions. Despite the already mature and reliable technology in making piston compressors, RefComp stilldiligently researches and innovates to further improve the piston compressors' performance such as quality and reliability.RefComp SP series include 34 models, with 2, 4, 6, 8 cylinders, rated power ranging from 3 to 70 HP. ●High efficiency, high strength, low vibration, low gas pulsation and lownoise, which is achieved through new technology, overall performancehas reached the world top level of the same types of compressors.